Pointing a satellite dish can be done with no special tools but a couple of spanners and a Philips screwdriver, i.e. less than 5$. 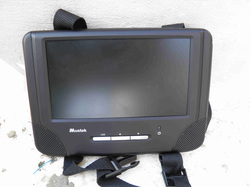 You could spend up to $50 if you decide to purchase a specific satellite finder device and a basic satellite receiver. Proceed in daytime and make sure not to fall or hurt yourself when moving on roofs crowded with water pipes, cables and other steel wires. A TV Satellite is geostationary meaning has a fixed position somewhere on the equator. Its position is given by a number (the degrees) and a direction: East or West. The zero degree corresponds to a Satellite positioned over Greenwich meridian. No need to know more about satellites however you need to know the name of the one you are targeting, its position and a few of the TV channels available on it. You also need to have an idea about your location, at least how to roughly look East or West. 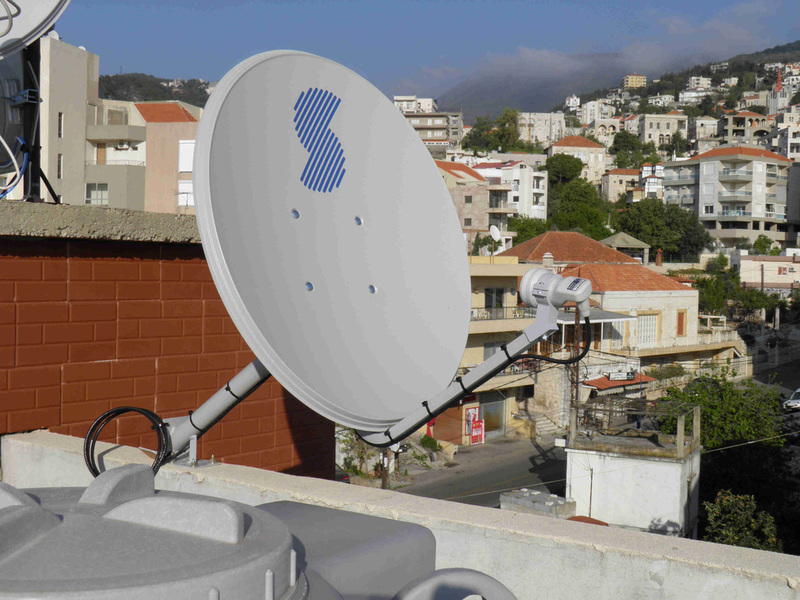 The job then consists of rotating the satellite dish horizontally and adjusting its inclination angle until the signal appears. Always start by looking at the satellite dishes of your neighbors and try understanding which are the ones that point to the requested satellite i.e. East or West and start by aiming and tilting yours in the same approximate manner. 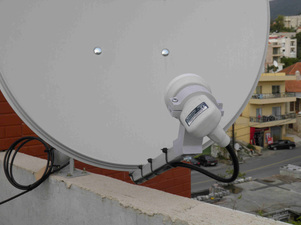 The same applies to the satellite dish LNB tilting (see below). Set it first a bit like your neighbors. 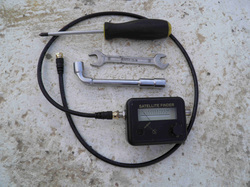 ​Start by preparing the needed tools and optionally the Satellite Finder along with a short length of cable with an F connector fitted on both sides. 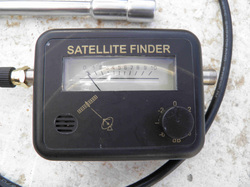 ​The satellite finder connects in line between the LNB and the receiver. Its ports are marked with “TO LNB” and “TO REC”. It does not tell the name of the Satellite you’re catching! The easiest way remains to carry the smallest TV set and your satellite receiver to the roof so you can see what is happening while tilting / rotating the dish. I do keep myself an old LCD screen from a car DVD machine and a cheap basic receiver bought at 18$ for this purpose. You will need however to provide power for these. If you chose this method, turn on your satellite receiver and from the Menu go to “Installation” > “Manual scan”, select the Satellite you want then a frequency out of the list provided by the SAT TV broadcaster on its website; if you do not find your satellite in the list, go to “TP Edit” and enter the frequency and settings of a particular channel as found on the website. Now you will see two metered indicators on your screen for the satellite TV channel signal: “Strength” and “Quality”. The purpose is of course to get the highest reading on both. 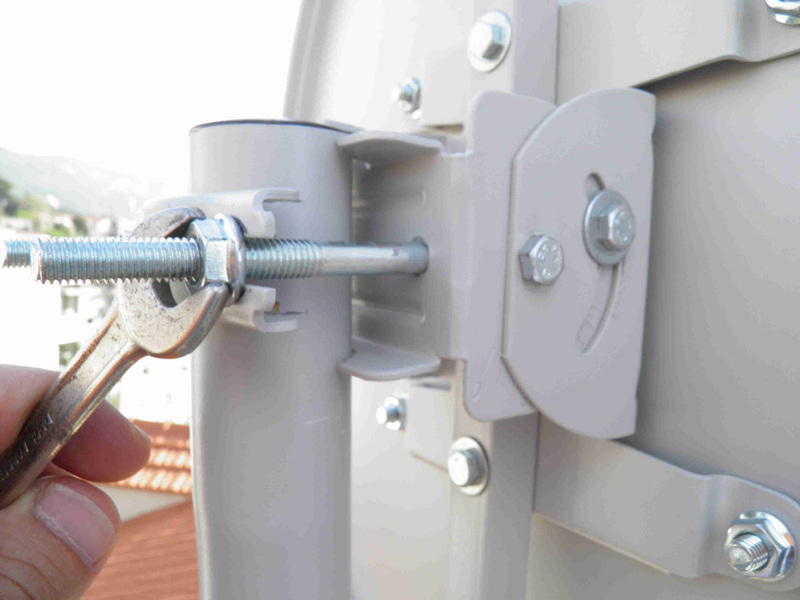 ​1- Loosen the nuts of the U-bolts that hold the satellite dish to the pipe just enough to allow you rotate it. 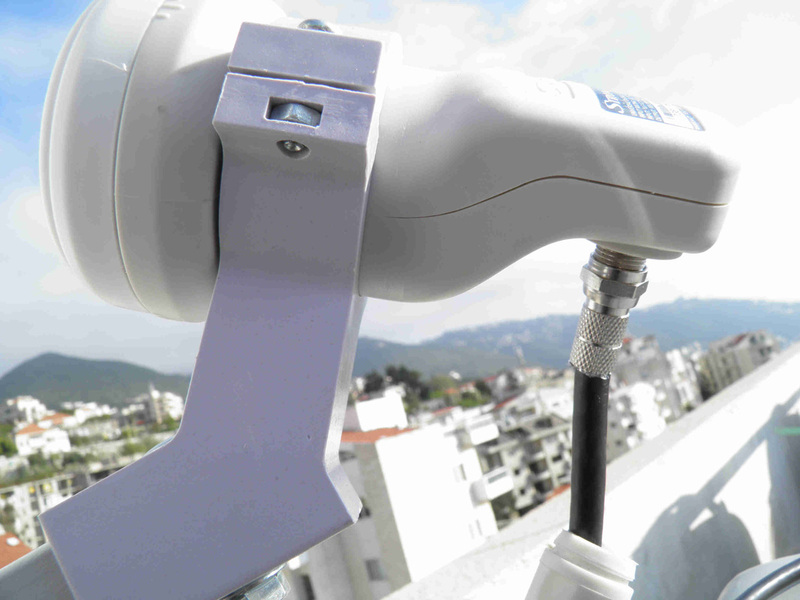 ​4- Rotate/tilt the satellite dish and observe the signal on your satellite finder or receiver, compete by tilting the LNB. 2- Loosen the nuts holding the satellite dish to its support and the one for tilting it just enough to allow you tilt it. 5- Once the signal on your receiver is >70% run a scan of any TP and make sure you’re on the right Satellite. 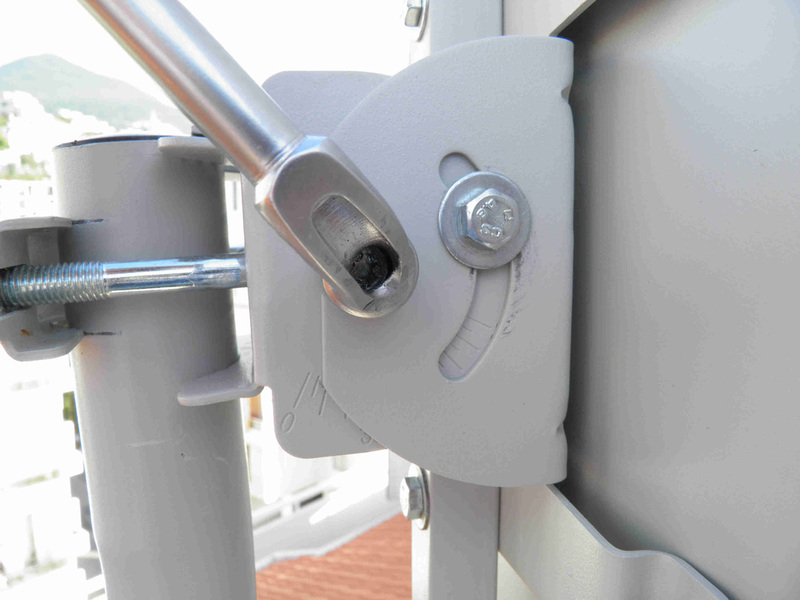 3- Loosen the screw that holds the LNB to its clamp (Philips head) just enough to allow its tilting. 6- Tighten well all bolts and nuts of the satellite dish and do not forget the LNB screw.